The history of Ruster Ausbruch’s fame begins in the 1680’s. Leopold I’s Holy Roman Empire was busy fighting sporadic incursions from the Ottomans along the edge of the empire. In order to finance his battles he agrees to establish Freistadten (or “Free Cities”). This meant that for a fee a town or village could secure an amount of self-determination unheard-of in this era. The tiny village of Rust was able to secure this coveted status for 60,000 gold coins and 28,000 liters of Ruster Ausbruch! Such was the reputation of this voluptuously sweet, botrytis-affected wine, unable to be made anywhere else, that the emperor agreed to forgo gold in exchange for Ausbruch. Once news of this took off, Ausbruch was in demand throughout the courts of Europe and supply could not satisfy demand. Though as with many wine styles and traditions, the arrival of phylloxera in the late 19th century brought the production of Ausbruch to a grinding halt. As the wine word recovered, efficiency and large production were the ethos of the day and Ausbruch was forgotten due to the intensive labor and the cost required for producing quality nobly sweet wines. Heidi is determined to bring this irreplaceable wine out of obscurity and return Aubruch to its place as an Austrian treasure. Ruster Ausbruch is so special because of the unique climate that facilitates its creation. Rust is situated on the western shore of Lake Neusiedl, one of the largest lakes in Europe, but its lowest depth is no more than 5 feet deep. Winds blow east from Hungary’s Pannonian plain towards the vineyards, forming an amphitheater around Rust, the air cools but also picks up moisture. Rust is located in the DAC Wine Region of Burgenland, an area famous for considerably higher than average hours of sunlight compared to the rest of Austria. These vineyards are also situated on the gentle rolling foothills of the Alps providing a cool environment for a long, sunny ripening. This combination of sun, elevation and cool, damp air creates the perfect conditions for the growth of Botrytis cinerea, or “noble rot.” Healthy botrytis shrivels the grapes to raisins and concentrates the sugars while contributing unique flavors to the final wine. To make Ruster Ausbruch, the grapes must achieve around a BA or TBA level of concentration (around 138 Oechsle). In order to keep good botrytis from turning to damaging “grey rot,” meticulous vineyard work by knowledgeable viticulturists is paramount. Only the best grapes with good botrytis are selected for the Ruster Ausbruch “On the Wings of Dawn” cuvee. The raisinated grapes are macerated for a few hours and then gently pressed. After fermentation the Ausbruch is moved to small, old acacia barrels where it will rest for at least two years. Because of the high levels of residual sweetness in the wines, Ausbruch can age for decades upon decades. 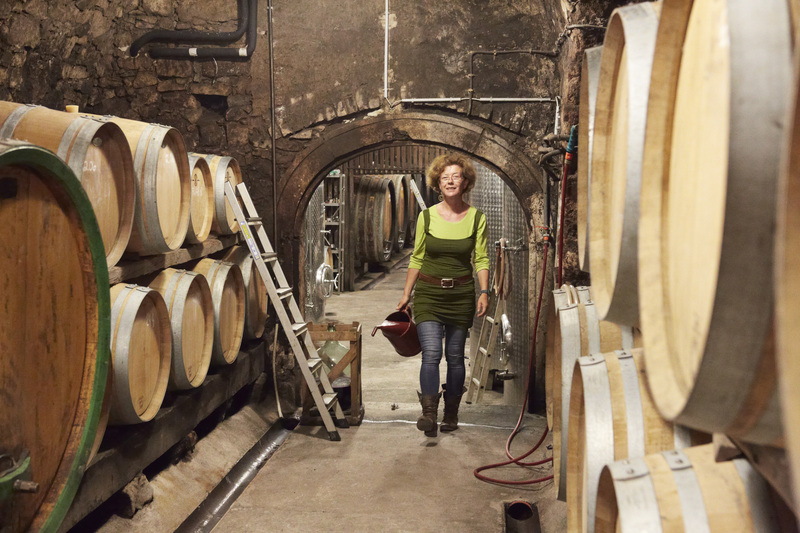 Though this may be enough for some winemakers, Heidi is not satisfied with only making world-class sweet wine, she also crafts dry examples of Weissburgunder (Pinot Blanc), Grauburgunder (Pinot Gris), and Furmint (of Hungarian Tokay fame), as well as the truly unique rosé called “Biscaya.” As the name suggests Biscaya is meant to be reminiscent of and pair with an array of savory dishes like lobster bisque. A field blend of red and white varieties, Biscaya transcends the category of rosé and shows itself as a wine of consequence and age-worthiness. Should you ever have an opportunity to see this beautiful region yourself, make sure to visit Heidi and Rust. Then you will see what makes these wines so special. Heidi’s wines are similar to the woman herself: generous and friendly, yet elegant in their grace. 95% Gelber Muskateller and 5% Muscat Ottonel grapes were picked at the beginning of the harvest in mid-September and fermented in stainless steel tanks. Matured in acacia casks for five months. Harvested by hand. Temperature-controlled fermentation in stainless steel tanks then matured for 6 to 8 months in large wooden casks. The grapes come from the vineyards Turner and Kräften (limestone and sandy loam) in Rust. Harvested by hand and fermented spontaneously with native yeasts. Matured in 300 liter new and older French oak barrels for 16 months on the fine lees. The grapes are from Turner and a smaller plot in Vogelsang vineyard. Furmint is a late-ripening grape and is harvested at the end of October. Fermentation and a long maturation take place in large acacia wood casks. A blend of Merlot, Pinot Noir, Cabernet Sauvignon, Lagrein, Teroldego, Syrah and Petit Verdot from the Ruster vineyard. 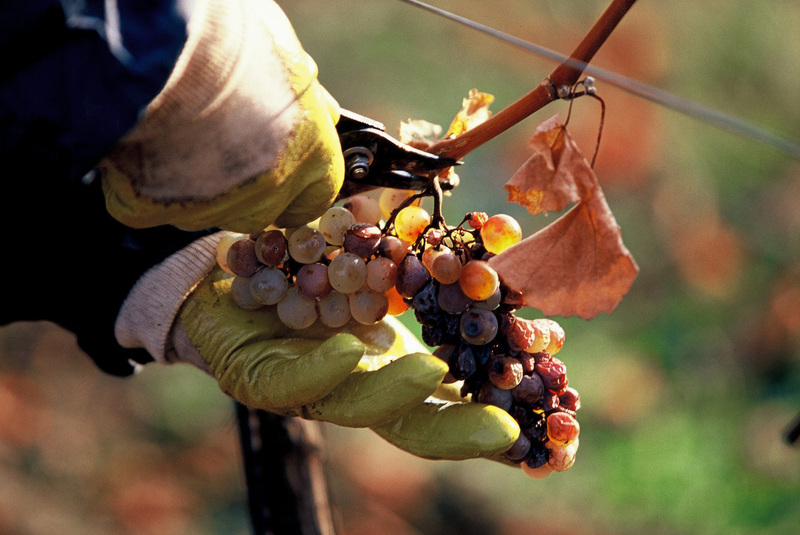 Grapes are selected from the Vogelsang and Turner vineyard. Fermented and matured in 225 liter barrels. Hand-selected solely from botrytis-effected raisinated grapes of the varieties Welschriesling, Weissburgunder and Grauburgunder and fermented in 225 liter barrels. Filtered and bottled after 24 months maturation. An exclusively single vineyard, single varietal Ruster Ausbruch, only produced in exceptional years in very limited quantities. This 2014 is 100% Furmint from Turner vineyard, a total of 180 liters fermented and matured for two years in two 90 liter barrels from the Cooperage Franz Stockinger.